Situated just below the Citadel within easy walking distance of the Old City and its synagogues, the Ron Hotel is ideal for the religious guest. With its own synagogue on the premises and a Sabbath observance policy, the Ron Hotel is frequently used by religious groups for Shabbat seminars, especially in the winter. In the summer vacation period the hotel is very popular with religious families and couples. The hotel has 50 spacious twin bedded guest rooms and the hotel will provide extra beds and cots if necessary. The en-suite bathrooms have both a tub and a shower so it is easy to bathe the children after a day out. The lounge area is off the dining room and there are plenty of very comfortable lounge chairs and sofas. The seating is arranged in groups so that it is very easy to sit and chat and not notice how much time has gone by. The hotel is usually open for groups during the winter and the Ron serves a traditional Israeli breakfast, buffet style, between 8.00am and 10.00am. Evening meals are also available by arrangement for groups staying in the hotel during the week throughout the year. During the main summer vacation period the restaurant/dining room is open for evening meals for individual guests and their families. On Shabbat throughout the year, the dining room really comes into its own. With waiter service on Friday night, groups can enjoy a real Shabbat atmosphere, eating good traditional food and singing to their hearts content. Sabbath lunch is served after services, and a third meal is available in the late afternoon. There are three function / seminar rooms available for groups. Two large rooms that can hold between 100 to 180 people and the other, a smaller more intimate room, which holds 30 to 40 people. These rooms can be used for private dinners for groups or family functions. The pool is unfortunately closed for repairs at present and is not expected to open for the 2010 season. When the pool is open there are separate swimming hours for men and women. 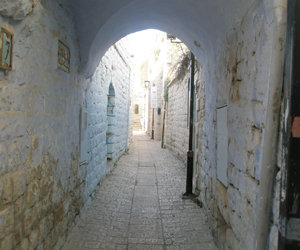 Coming into Safed, pass the bus station and go up Jerusalem Street towards the circle, and turn left onto Palmach Street, just before the Palatine building. Continue along Palmach until you reach Hativat Yiftah Street where you turn right, passing the Citadel park on your right. Continue on and you will see the Ron Hotel in front of you. Individual rates are from 450 ILS per couple per night including breakfast in the low season to 600 ILS per couple per night in the high season. Shabbat meals are 90-100 ILS per person per meal. Weekday evening meals are 80-90 ILS per person. Group rates are on application.